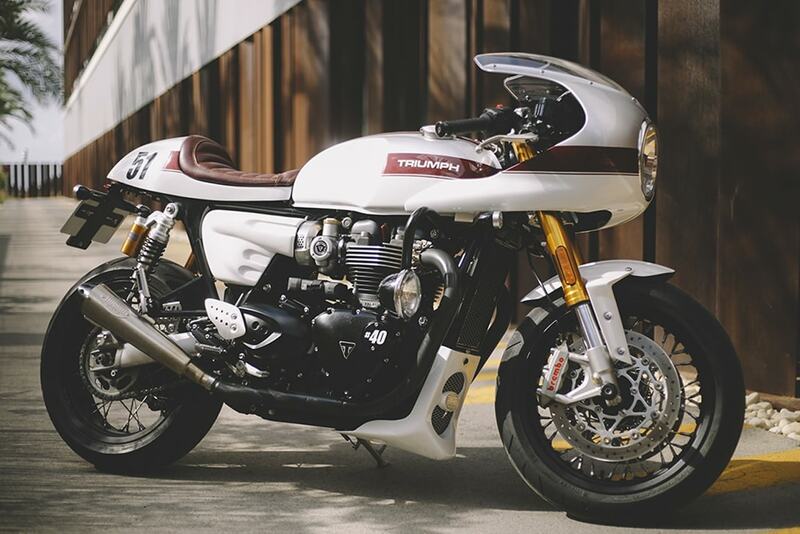 When Triumph released the new Thruxton generation, more powerful and sporty, we knew that a Café Racer cowl would be a great part to develop in our catalogue, but we would never imagine that would involve such an amount of headaches, both for our clients and us. Several mistakes were made during the case construction of this part, and those tiny mistakes fell into bigger problems once the seats were delivered to our clients. Fortunately, all these problems are now more than solved and the Thruxton Café Racer seat made by Tamarit became the most purchased seat up to date. The seat for Triumph Thuxton 1200R is based widely on the classic concept, which gets sporty lines in order to perfectly blend with the sportive Thruxton range cooled by liquid. It's made of tough and high quality fiberglass and the cushion is made of polyurethane covered by a water and fire proof nautic leather that you can choose between dark brown or black. In order to provide the best service to our clients, this seat can be ordered painted in the colour of your Triumph motorcycle and would take around 15 working days to be shipped anywhere on the planet. Thruxton 1200 Cafe Racer seat. With this new cowl for Triumph Thruxton 1200 and 1200 R , we try to find the perfect balance between classic and sport, stylish and aggresive. Lines to have enough personality in order to dissociate from the rest of seats that started to crop up, but not being to pretentious, since that would reduce its reach remarkably. When complaints started to arrive to Tamarit office, we had to take the painful call of unlisting that part from our online shop in order to find out the root of the problem that was creating such an amount of unsatisfied clients, and to not uploading it again until those problems and mistakes wouldn't be solved permanently. At first we thought that the problem appeared because of some millimetric difference between the frames of the Triumph Thruxton 1200 and the Triumph Thruxton 1200R one, nevertheless, after a few calls to the Triumph tech main department in Madrid, they guaranteed that the frame for the 1200 and the 1200 R was exactly the same, that those unfitting errors were unlikely to come from the difference between one frame and another. 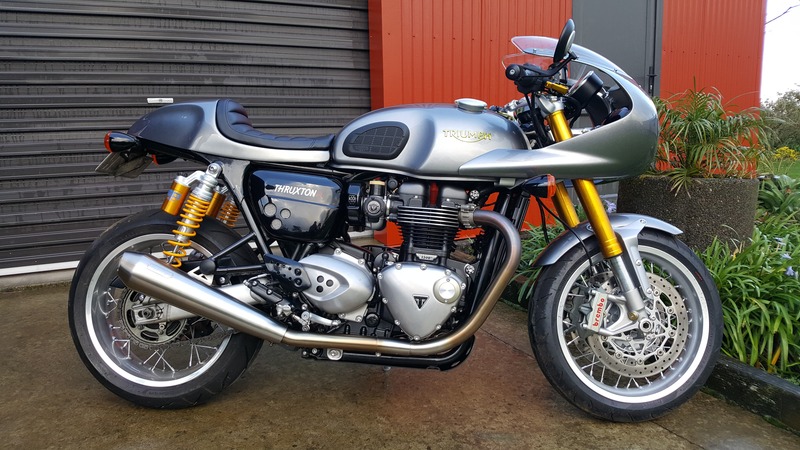 It was mandatory then, to find someone with a new generation Thruxton who could let us have the bike for a undefined time at our workshop, and after that we would be able to make a new case thoroughly, with it's anchor points perfectly aligned from scratch. Sadly, such sign of generosity wouldn't be happening until few weeks ago. 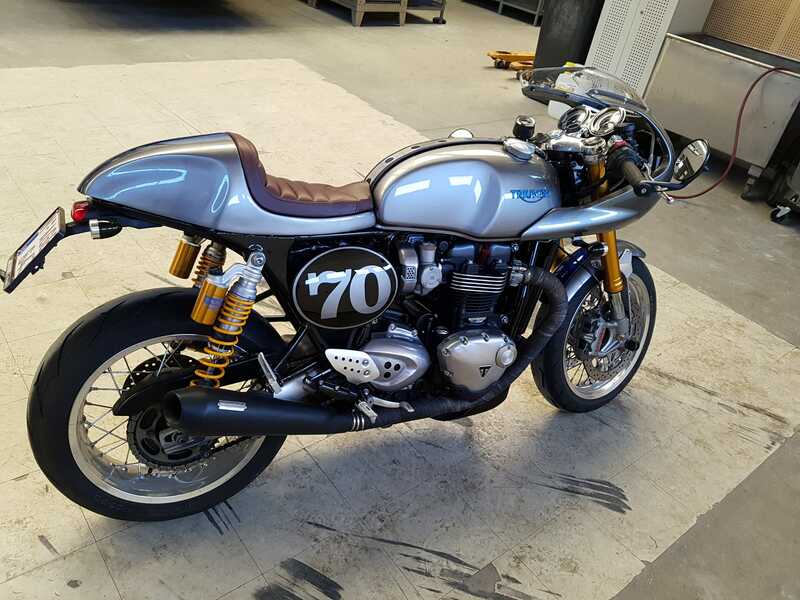 As a difference when the first case was made, during that time we had some Thruxton 1200 full time in our workshop, since that were the donor bike for our 24th, 25th project: Babieca and Sombra. The Thruxton R Cafe Racer seat its installed almost identically than the stock one. 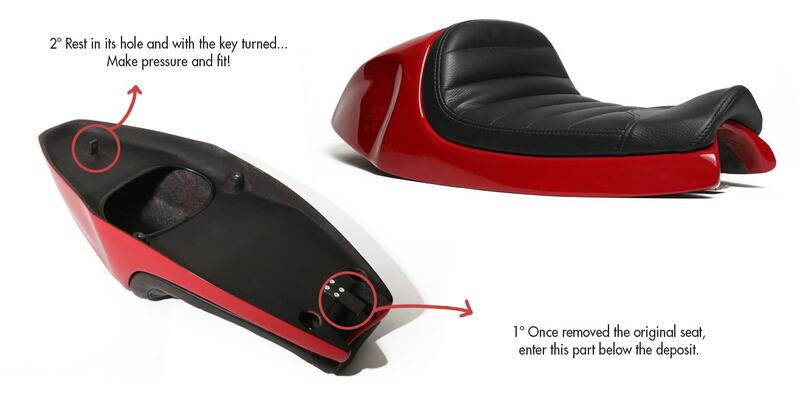 First, you have to remove the current seat by using the ignition key and after that, align the Mónaco Seat by Tamarit by setting the front flap on its place. Finally, push down gently the seat towards the frame and make sure that the pin is inserted on the lock, you would feel how the automatic latch is locked and the seat is ready to go.